The importance of optimizing dietary fats and oils is a common and recurring theme for both health-minded people and professional health practitioners. In this Natural Truth post, we will consider our need to control or optimize fats and oils in our diet, and cover what we believe are the most important and certain guidelines for this practice. At one point or another, and especially if you live in an affluent country, you likely have been advised to reduce, change, or perhaps increase the amount of fats and oils in your diet – whether via news pieces or scientific papers, by your physician, or by a well-intentioned friend. Unfortunately, and as with other controversial nutritional health areas today (including the companion or reciprocal topic of carbohydrate optimization), the advice we get regarding fat and oil consumption is often contradictory. And crucially, this is not simply a matter of differing personal opinions. In fact, scientific views today regarding our ideal amount fat and oil consumption are now: 1) highly divergent and opposed, 2) far more fractured than they once were (with a clear low-fat/high-carb orthodoxy and a growing high-fat/low-carb contrarian view), and 3) perhaps gradually but significantly changing, or even reversing. In the last case, this change is owing both to newer and more fat-friendly research findings, along with fresh re-examination and criticism of earlier fat-adverse studies (for a recap of the key scientific issues and controversies regarding aggregate fat and oil consumption, see OACS Fat Controversy). In addition, and compounding more basic fat and oil consumption debates by scientists, are cross-cutting findings that our personal ability to healthfully process fats and oils depends on a number of individual factors. One of these is our genes, with both familial and regional genetic differences affecting our ability to manage dietary fats and oils of all kinds – notably including both saturated animal fats and unsaturated vegetable oils (see NCBI Genes & Saturated Fats and Cornell Genes & Fatty Acid Metabolism). In particular, our genes may: 1) either promote or limit tissue inflammation and other negative health effects in the presence of either saturated fats or omega-6 fat-rich foods, 2) allow us to personally tolerate high amounts of specific fats and oils, such as dairy fats, olive oil, or coconut oil, and 3) engender allergies to or poor dietary tolerance of specific oil-rich foods, such as fish or avocados. By contrast, another important factor influencing our ability to healthfully process fats and oils is our personal lifestyle, including a variety of effects from our environment. In addition, our level of exercise and physical activity, the quality of our overall diet, and other lifestyle factors like smoking, alcohol consumption, and chronic stress can significantly influence the way, and ultimately how well, we metabolize fats and oils (see NEJM Exercise & Blood Lipids, SD Diet Quality & Fat Metabolism, NCBI Smoking & Fat Metabolism, LWW Alcohol & Fat Metabolism, and NCBI Stress & Fat Metabolism). Given current scientific ambiguities and controversies regarding fat and oil consumption, you may be tempted to give up trying to use dietary fats and oils more attentively and optimally. But this would be an enormous health and even life-limiting mistake. Despite the complexity of the topic and current scientific controversies regarding dietary fats and oils, there are a number of principles and practices related to fat and oil optimization that we know, with high scientific certainty, can lead to better health, longevity, and quality of life outcomes in nearly all people. > #1: Some fats and oils are essential to life – it is important to start by highlighting that dietary fats and oils are critical macronutrients and contain crucial micronutrients – with a variety of essential fatty acids and companion fat-soluble vitamins required for energy, metabolism, hormone production, and tissue health, to begin a list – and we would not survive for long without them in our daily diet (see Wikipedia Fat). > #2: Optimal fats and oils vary by person and group – as touched on, the ideal total amounts and types of fats and oils we should consume each day, typically understood or measured as a percentage of total calories, is an area of current scientific debate and also one where there appears to be natural individual and regional variation between people and groups. Some diet programs today recommend low dietary fat levels, while others directly or implicitly (for example, by promoting low carbohydrate consumption) encourage high-fat diets. HumanaNatura believes both recommendations are incomplete or simplistic, and that there is inadequate science today to support either view categorically. Our Natural Eating guidelines for total fats and oils are therefore more flexible and individualized than this, and appreciate that some of us will tolerate fat and oil-rich foods better than others. In HumanaNatura’s OurPlate healthy eating model, derived from our Natural Eating guidelines, we encourage personal exploration of different quantities of fats and oils, or different fat-carbohydrate ratios, within our larger dietary guidelines, along with assessment of our physiological response to different fat-carb ratio eating. Perhaps even more decisively, and as we will discuss, we also encourage significant care with the qualities or types of fats and oils we consume. > #3: Optimal fats and oils vary by overall diet – along with emphasizing the essential nature of dietary fats and oils, the most important lesson in this discussion may be that the optimal amounts and forms of dietary fats and oils appear to vary significantly by our overall diet – in addition to the other lifestyle factors we have touched on. In particular, when dietary fats and oils are combined with high amounts of carbohydrates, and especially sugars and other refined carbohydrates, the combination appears to reliably lead to a number of negative health effects, including unhealthy weight gain, elevated body fat, tissue inflammation, and insulin resistance (see NCBI Dietary Fat & Insulin Sensitivity). Crucially, the broadly unhealthy nature of mixing dietary fats and sugars – or in essence, of having a diet modeled on pastry ingredients – may explain the immediate health benefits that many people experience when following a high-fat/very low-carb or ketogenic diet for a time (often reversing each the above negative health trends – see Wikipedia Low Carbohydrate Diet). > #4: Some fats and oils are healthier than others – even with personal, regional, lifestyle, and overall diet differences, on average some fats and oils appear to be healthier for us than others. In general, monounsaturated vegetable fats like olive and avocado oil, along with many nut and seed fats, appear healthier for us overall, as are omega-3-rich oils from fish and others sources (see Wikipedia Monounsaturated Fat and Omega-3 Fatty Acid). By contrast, high amounts or proportions of saturated fats, especially from animal sources, and also vegetable oils rich omega-6 fatty acids, such as corn oil and sunflower oil, may be moderately to significantly less healthy for us overall (see Wikipedia Saturated Fat and Omega-6 Fatty Acid). In addition, hydrogenated oils or trans fats have been shown to cause cardiovascular disease and other health disorders, and today are being outlawed by national governments (see AHA Trans Fats). We will assume that some, though perhaps not all, of these foundational ideas or principles are familiar to you. What is often less intuitive or well-understood are the essential, or least scientifically controversial, practices for optimizing fats and oils in our diets. – Avoid trans fats, hydrogenated oils & other modified fats – as mentioned, these undesirable and unnatural fats and oils are vegetable oils that have been modified either for palatability or to aid the manufacture of various food products. As a group, they are notable for their strong link to cardiovascular disease (see AHA Trans Fats). Owing to these and other negative health effects, modified oils are becoming illegal or otherwise are being phased out in many countries, and we have good reason to avoid or greatly limit them in our diet. – Moderate saturated animal fats – as discussed above, we have a good scientific basis to moderate the amount of saturated animal fats in our diets, but not to avoid them entirely. Indeed, some studies have found that people had better health outcomes with moderate saturated fats in their diets than people who substantially reduced them, or replaced lost calories from reduced animals fat with either omega-6-rich vegetable oils and/or added carbohydrates (see BMJ Saturated Fat Replacement and NCBI High Carbohydrate Diets). In any case, moderated animal fat consumption appears prudent, notably as does moderating overall protein intake (NCBI Adverse Effects Associated with Protein Intake). – Ensure omega-3 fats – as we have highlighted, it is important to ensure that a significant amount of our fats and oils are rich in (natural) omega-3 fatty acids, since they broadly produce tissue health and have other important health effects. Key sources of omega-3 fats include fish, fish oils, eggs, grass-fed dairy, and several types of seeds and nuts (again, see Wikipedia Omega-3 Fatty Acid for a fuller discussion and food list). 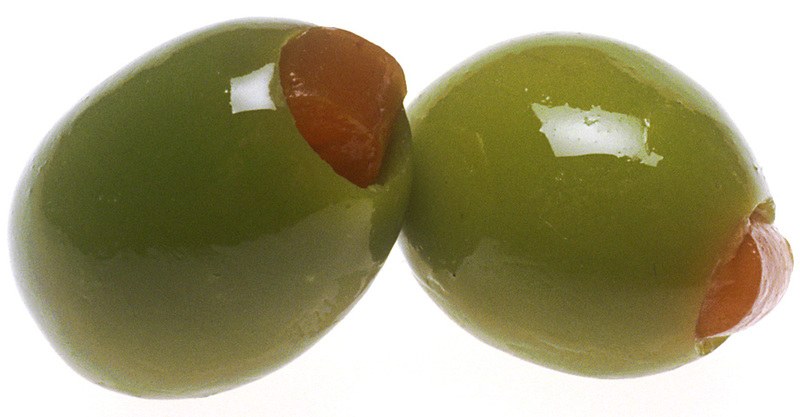 – Consume healthy vegetable fats and oils – in addition to eating the above omega-3 rich fats, other vegetable fats such as raw olive oil, the oil-rich flesh of avocados, olives, and other raw-edible seeds and nuts can be extremely healthy for us (see Wikipedia Olive Oil Health Effects, NCBI Avocado Health Effects and MC Nut Health Effects). – Avoid fried foods & fatty meats – these are each easy steps that can greatly reduce both total and unnatural fat in our diets, and also unhealthy excesses in both omega-6 rich cooking oils and saturated animal fats. On this last point, it is important to note that fatty meats are generally unnatural in themselves, and are typically produced by feeding animals unnatural and environmentally harmful diets high in grains and legumes. By contrast, naturally-fed animals are normally much leaner, as are meats derived from them. – Avoid high temperature frying – in addition to avoiding fried foods, research suggests that we should further avoid cooking with fats and oils at high temperatures, especially to the point of oil smoking, since this tends to destroy nutrient quality and may produce carcinogens (see Wikipedia Deep Frying Hazards). Steaming, roasting, or mid-temperature sautéing of foods are all preferable options, and in this order. – Avoid sugars and refined carbohydrates – as discussed, consuming sugars and refined carbohydrates, and perhaps significant carbohydrate eating more generally, may be unwise amid elevated fat and oil consumption in all its forms (again, see NCBI Dietary Fat & Insulin Sensitivity). – Ensure a vegetable-rich diet – also as emphasised before, a diet (naturally) rich in raw-edible vegetables will help you to process fats more efficiently and healthfully, and likely both directly via improved nutrition and indirectly by fostering healthier intestinal bacteria (see HSPH Vegetables & Fruits). Indeed, vegetables and fruits, rather than proteins and fats, can be understood as the natural foundation or most elemental aspects of our diet and ideally should be the largest part of our food volume (though not calories) each day. – Ensure daily exercise – much as with ensuring a green diet, (natural) daily exercise has been shown to greatly improve our ability to metabolize fats and of course to promote our health generally (again, see NEJM Exercise & Blood Lipids). – Avoid chronic stress – as touched on earlier, chronic stress and psychologically demanding lifestyles have been shown to impair our natural ability to process fats and oils, and to lead to reduced health and quality of life outcomes more generally (as before, see NCBI Stress & Fat Metabolism). – Avoid smoking and alcohol – both smoking and alcohol use have been shown to reduce our ability to metabolize fats and oils, and are associated with diseases driven by excessive or otherwise unnatural fat and oil consumption (again, see NCBI Smoking & Fat Metabolism and LWW Alcohol & Fat Metabolism). – Have clear fat and oil intake goals – as discussed before, and in more depth in the Natural Eating section of HumanaNatura’s Personal Health Program, it is essential to have clear fat and oil intake goals, and to assess your physiological response to different fat-carb ratios. Given our discussion, HumanaNatura rates the idea that careful control of our dietary fats and oils is essential to our long-term health an 8/10 (Strong Evidence) in our Natural Truth rating system. We base our rating on the above referenced research, which broadly recommends care with fats and oils, and supports the dietary fat and oil guidelines we have introduced. However, our rating is less than a perfect score because the optimal amount and mix of fats and oils in our diet is not yet precisely known, is controversial scientifically in several areas, may be perhaps strongly influenced by the overall quality of our diet and lifestyle, and also may depend significantly on a person and region’s dominant genetics. But even with these caveats, the guidelines we have presented should help most people successfully consider and progressively optimize their fat and oil consumption, and their diet overall, for superior personal health and fitness. 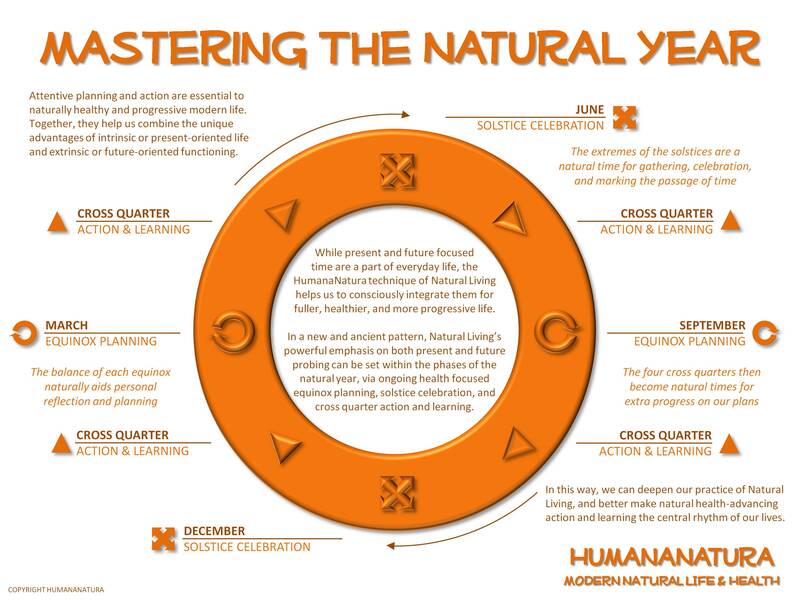 For a more complete view of HumanaNatura’s Natural Eating recommendations, see our OurPlate healthy eating guide and comprehensive Personal Health Program. You can also click the following link to learn more about our Natural Truth health information campaign and evidence-based 1-10 rating system. And we always welcome your comments and input on this or any other HumanaNatura Natural Truth review. We weren’t planning on posting a meal this week, but this one looked so good, we decided to share. 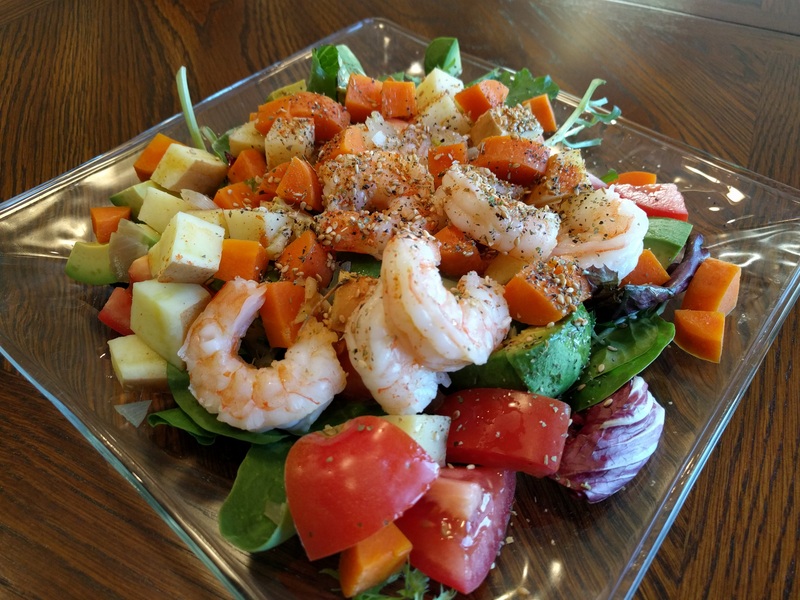 Made the HumanaNatura way and following HumanaNatura’s OurPlate healthy eating guidelines, our Sesame Shrimp Salad Meal took minutes to prepare, is as healthy as a meal can be, and tastes as good as it looks. This uncomplicated and inviting HumanaNatura Salad Meal begins by steaming a mix of diced carrots, white sweet potato, and onion, along with crushed and finely chopped garlic and a shake of red pepper, for about five minutes, with several pre-cooked shrimp added in the last minute (see our Cooking With Steam Overview for guidance if you are new to food steaming). The shrimp and root vegetables are then allowed to cool for five minutes or so. While the steamed foods cool, a salad base of mixed greens is prepared, along with a simple mix of diced tomato and avocado. The cooked foods are then arranged on top, and the salad is dressed with olive oil, a splash of sesame oil, and white wine vinegar. Lastly, the meal is seasoned with herbs, sesame seeds, and black pepper to taste, and served promptly. Fast, easy, and delicious! Sometimes, only beef will do. Though we recommend limiting red meats – and always eating sustainable grass-fed varieties – beef can be an occasional or even regular indulgence and still be healthy, especially when we eat the HumanaNatura way and follow HumanaNatura’s OurPlate healthy eating guidelines. Our Beef and Orange Steam Meal shows how beef or any red meat, simple veggies, and a piece of fruit can be combined to create an extraordinary, satisfying, and healthy meal in just minutes. Today’s example HumanaNatura Steam Meal begins with a base of diced carrots, white sweet potato, and onion, along with crushed and finely chopped garlic, upon which several bite-sized cubes of beef are placed. These foods are seasoned with red pepper and coriander, and initially steamed for about three minutes. Then, a mix of shredded cabbage and carrots, and a bit of cut orange bell pepper, are added and the meal is steamed for another two or three minutes. A handful of chopped baby spinach is added, the heat is turned off, and the meal is allowed to sit covered for a minute or two. 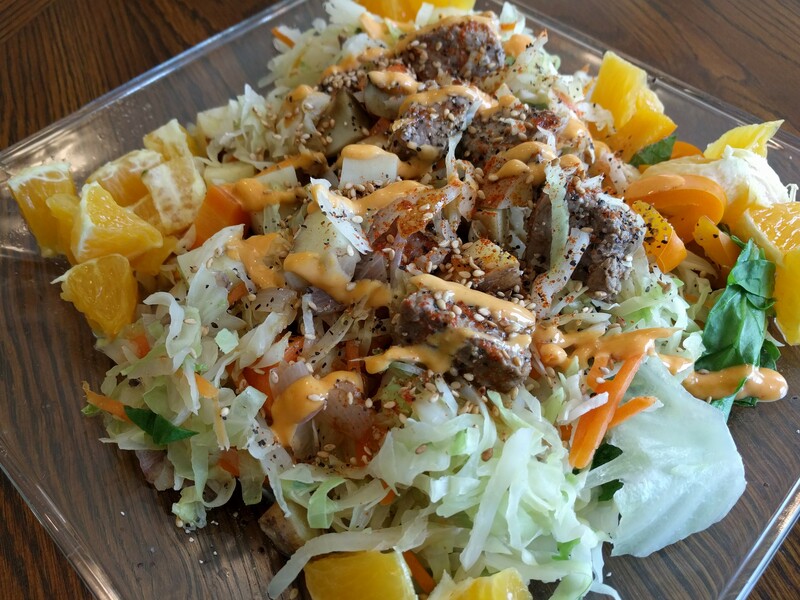 The meal is then plated and served promptly, after being garnished with splashes of soy sauce and sesame oil, a bit of black pepper, a scattering of sesame seeds, a drizzle of sriracha mayonnaise, and peeled and chopped orange. Simple, and simply delicious!